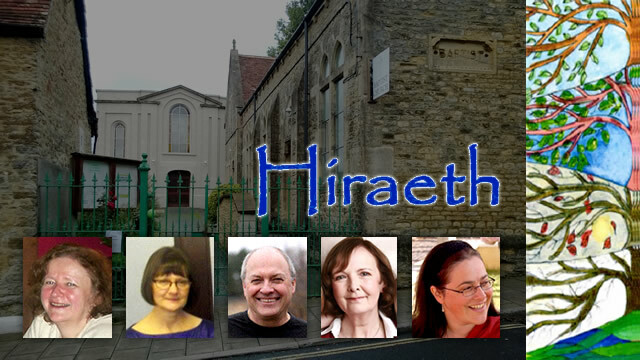 Hiraeth (Welsh, meaning ‘a longing for home’) is a group of friends who share a passion for harmony, good music, and fun. On Friday 28th October the group will be performing an eclectic mix of music including folk, swing and pop, at Wincanton Baptist Church. The show starts at 7.30pm and will end around 9.30pm. The band line-up comprises five members: Norman – instrumentalist (who thinks he is the band leader), Ingrid – vocalist, Shayla – vocalist, Jan – instrumentalist, and Ros – instrumentalist. They produce great music and vocal harmonies to warm the soul, and between them they play a mixture of instruments including, guitar, harmonica, bassoon, flute and keyboards. These guys have to love what they do because rehearsals pose a major logistical challenge. Norman and Ingrid hail from Barnoldswick in Lancashire; Jan is from Shrewsbury in Shropshire; Ros is a little closer from Aldbourne in Wiltshire, and Shayla is the local lass, pastor of the local Baptist Church on Mill Street. So, for a great evening of music and fun, contact Shayla Merivale. Email or phone 01963 548755, and reserve your ticket. Admission is free, but as seating is limited we recommend you book a ticket in advance to be absolutely sure.